For my after party project I used the cricket and sentiment from Bitty Bugs along with one of the jars from Jam Jars to make this cute little tag. I wrapped the bread with tulle and attached the tag, I also had a jar of jam but forgot to put it in the picture. I thought this was just the perfect set for a little tag! Please head over to Your Next Stamp and check out what the design team have created, they are so talented and creative, you'll find more inspiration and new projects using the new release stamps and dies. What a cute, bright tag and the sentiment is ideal for a gift tag! 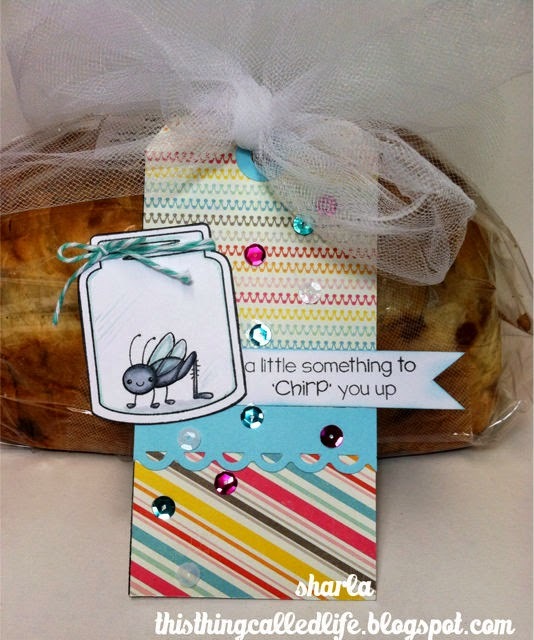 Gorgeous tag with that yummy loaf of homemade bread, Sharla! I love the colors and use of tulle! It's so nice that you stopped by my blog today. Hope you are having a great summer! HUGS!